Continuing from the previous entry about Joan Waste, I came across another “martyr” from the region where I spent my childhood. This time I put the word “martyr” in quotes because of uncertainty about the man and his beliefs. Accounts of his life vary significantly. My particular interest came about after reading that he was born in Burton-on –Trent (my own birthplace), but elsewhere it is stated that he was born in Burbage, Leicestershire and later moved to Burton. His particular claim to fame is being the last “heretic” to be executed by burning in England. 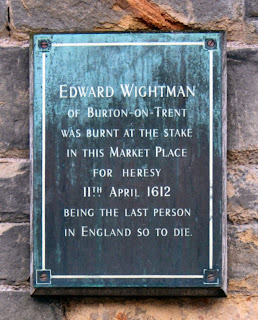 Edward Wightman was executed in 1612, not by the Catholic Church of Queen Mary, but by the Church of England under the instruction of King James I. The nature of his heresy differs according to which account you read (more contradictory evidence!). He was charged with eleven distinct heresies, including his belief that "the baptising of infants is an abominable custom” and that “Christianity is not wholly professed and preached in the Church of England”. Some of the other charges against him were so extreme that it was said: “if Edward really held all the opinions of which he was accused, he would have been either an idiot or a madman, and, if so, he ought to have had the prayers of his persecutors rather than to have them put him to a cruel death.” Maybe this statement could be seen as questioning the legitimacy of some of the accusations made against him. Wightman was sentenced to death by burning. On the first attempt to carry out the sentence, as the flames began to burn his flesh, he began to shout out something that was interpreted as a renunciation of his beliefs. He was pulled from the flames under the assumption that he was agreeing to submit to the faith of the Church of England. After his rescue from the stake he continued preaching his “heresies” and after a few weeks was returned to the stake and burned on 11 April 1612 at Lichfield, Staffordshire. I found your last two posts very interesting albeit saddening. I have read some of the Scots Worthies, Foxes book of Martyrs, and some of the Mennonites' and I am always heart-broken that so-called Christians are the perpetrators of these heinous crimes. In reading of these cases I also came across details that some of the more famous protestant martyrs had previously been involved in the sentencing and execution of earlier "heretics". To me it seems to demonstrate the truth of reaping what is sown. I'll try to find that information again and will consider adding it in a future post. Bob, the details I mentioned in the above comment are found at the following sites. Joan Bocher (d. 1550) (a.k.a. Boucher, Butcher) also known as Joan of Kent , or Joan Knel was an prominent Anabaptist and a member of the Strangers Church. A prominent person, she was held in jail for a year before she was finally sentenced and condemned to be burned at the stack on May 2, 1550 at Smithfield (London) for holding heretical views of Christ. 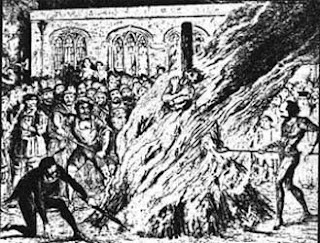 Ironically her judges Bishop Nicholas Ridley (c.1500-1555) and Bishop Hugh Latimer (c.1485-1555) were themselves burnt at the stake at Oxford in 1555 for heresy under Queen Mary. Anabaptist martyr. Her origins are unknown, though she is sometimes called Joan of Kent or Joan Knel. She first appears about 1540, supplying court ladies with copies of Tyndale’s Protestant vernacular New Testament. Before 1543 she was charged with heresy, but Strype (see Bibliography) claims that Henry VIII himself intervened in her favour. Joan Bocher’s brand of Anabaptism involved the assertion that Christ’s nature was wholly divine, and that consequently he had no human body born of the Virgin, but merely a phantom one. She was examined by Cranmer, Latimer and others in 1548, excommunicated in April 1549, and handed over to the Privy Council for punishment. She was imprisoned for a year, and though visited by such divines as Latimer, Whitehead, Ridley and Cranmer, she remained obdurate, On 2 May 1550 she was burned at Smithfield. The legend that Cranmer’s single-minded vindictiveness caused her death is unacceptable, since she was tried and condemned by due process of law. However, her death demonstrates that religious toleration for all Protestants did not exist during the Protestant reign of Edward VI. A.G.Dickens, The English Reformation, 1967; J.Foxe, Acts and Monuments, 1563; J.Strype, Memorials of Cranmer, 1848. Reaping what you sow... Very good point. What is YOUR Relationship with Scripture?